How can we bring an effortless yes to this moment? How do we stop running from “the mess of life”—our predicaments, our frustrations, even our search for liberation—and start flowing with all of it? In small venues throughout the UK and Europe, a young teacher named Jeff Foster is quietly awakening a new generation of spiritual inquirers to the experience of abiding presence and peace in our ever-shifting world. His informal gatherings, blogs, and kitchen-table video posts have created a rising tide of interest in his teachings. 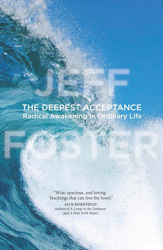 With The Deepest Acceptance, Jeff Foster invites us to discover the ocean of who we are: an awareness that has already allowed every wave of emotion and experience to arrive. While Jeff delightfully admits the irony of writing a book to convey something that is beyond words to teach, here he confirms his ability to guide us in unexpected new ways to a space of absolute acceptance and joy, no matter what’s happening in our lives. The book and CD set are also available on Amazon USA / Amazon UK or from your local bookstore.